Album Info: My first three years of railfanning the Canadian Pacific's Tomah Subdivision and Watertown Subdivision, part of their Chicago to Twin Cities mainline across Wisconsin. 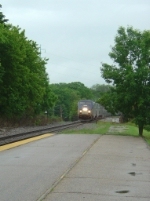 This is one of the busier rail lines in Wisconsin and the only one with regular Amtrak service. Some days it seems like all you see is CP's red, widecab GEs, but patience and luck will yield a wide variety of classic and colorful diesel power. Description: Soo Line 6051 helps a Canadian Pacific 8700 series GE ES44AC speed a freight westbound past Lewiston Siding just east of Wis. Dells while a couple of deer look on. Description: A crew was busy doing trackwork with a rail train near the Portage yard. 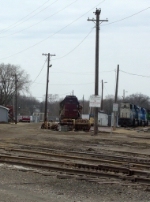 Description: I was pleasantly surprised to see one of these Soo Line relics bringing up the rear of the rail train. Description: The Portage yard contained a colorful variety of locomotives and other interesting-looking equipment; but what with the prominently placed "No Trespassing" sign and several unpleasant encounters with law enforcement experienced by a railfan aquaintance, I decided against going in for a closer look. Description: Amtrak's eastbound Empire Builder approaches its stop in Wisconsin Dells. Description: The Empire Builder passengers wait to board. Description: An eastbound startles the spectators waiting for the Columbus Independence Day parade to begin. Description: This time it's a westbound forcing a halt to the parade in progress. 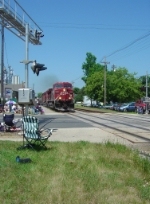 The local police were in contact with the CP dispatcher so they could safely stop the parade and clear the tracks in time. Description: Didn't think I'd see any rolling stock in service left with Milwaukee Road reporting marks in 2007! Description: The paint job of this Soo Line caboose is in considerably better condition than that of #46 from March! Description: This MOW outfit was sitting on a siding just outside of Portage. Title: SOO 4444 AKA "QuadQuads"
Description: 8858 leads sister 8801 with eastbound intermodal train 198 on the east side of Portage. Description: The train had a lot of double stack cars with no containers on them, as well as the ones that did have containers, although they may or may not have been actually loaded. Description: A faded CRIP relic in the Portage yard. Description: This MoW gondola still bears the name of the original owner of this line. Description: The Empire Builder races eastbound across Industrial Drive. Description: CP 9596 leads 6006 and a long mixed freight westbound into Portage on a rainy Thursday. Description: The first 1/3 or so of the train consisted entirely of covered hoppers. Description: This was one set of reporting marks I did NOT expect to see in Wisconsin, in 2007! I have since learned these marks were applied to identify Conrail cars going to CSX during the asset split with NS. The cars aren't actually ex-New York Central. Description: BNSF power sitting in the Portage yard. Description: An SD70MAC still in Burlington Northern colors.